Though the old saying goes “Twas a brave man who first et an oyster” I maintain that the first man (or woman) who grilled an oyster was braver. We thought we’d publish this little public service announcement to save you the unexpected (and potentially painful) excitement of exploding oysters that some of us (I won’t name names) have experienced in the past. Remove the tops from the fresh live oysters (here’s our oyster shucking guide) and grill them on the half shell in their own juices. They are done when the flesh is firm. Squeeze on a little lemon and serve. This simple (and safe!) 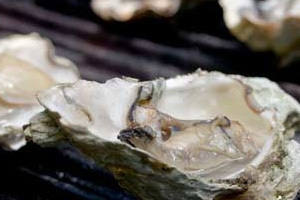 method can be used for grilling Pacific Oysters, Olympia Oysters, Kumamoto Oysters, and Virginica Oysters. Wow, what a great idea! I have never grilled oysters before, but I’m going to now.